To be sure, confetti was tossed by many of those glued to their computers and smart phones yesterday, but it was set up to be a disappointing day for most. The odds simply foretold it. Less than 20 percent would make it out of the Western States 100 lottery and get a golden ticket to the Big Dance in June 2010. The probability was just large enough to spark great hope but small enough to ensure a big wave of disappointment as the last few winners were pulled and eager would-be runners found their names left in the netherworld GU2O bucket of the UltraSignup server. I could go more in to the ups and downs of the day, but Craig Thornley captured it very well in his post last night. As folks recover from the lottery hangover, surely the debate will continue about the size of the lottery and the possible need to revise qualification standards to make Western States a more selective race - akin to the Boston Marathon. 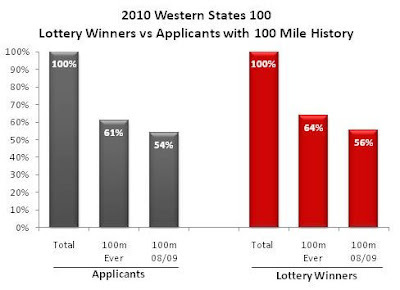 As an adjunct to this discussion, I thought I'd follow up my previous post on the number of applicants with 100 mile race histories in the lottery, with one on the number of those who actually made it out of the lottery who actually had 100 mile history. I followed the same general method as in the previous analysis (see post for details), and as such it has some of the same frailties. Overall it's a slightly blurred snapshot but one that should capture the general trend. Not surprisingly, the results are quite parallel between the applicants' histories and the winners' histories. Where about 61 percent of the 1519 applicants had ever completed a 100 miler (as found in Ultra Signup results) and 54 percent had completed one in 2008 or 2009; 64 percent of the 270 lottery winners had ever done a 100 miler, with 56 percent of winners notching at least one in 2008/2009. Clearly, these numbers are not groundbreaking news, and they seem to provide fodder for those on either side of the debate. For some, they'll show that the current liberal qualifying standards still allow a fairly 100-experienced field to toe the line. For others, it'll show that a good percentage of folks who have demonstrated their ability to complete a 100 mile race will be left out of the Grande Dame of 100's, their spots going to some folks whose hardest race may have been a flat 50 miler. Much more agravating to me than a person getting chosen who has never completed a 100 mile race, (but who otherwise has a legitimate qualifier under the current rules) is a person getting chosen who did not have a qualifier!!!!! whether they have run a 100 mile race or not!!!!! I already know of two names that had no qualifier and were picked. Someone told me that it doesn't matter. Two more names to replace them will not be chosen. Few thing anger me. That these people signed up and have no qualifier and kept perhaps other qualified people from getting picked does anger me. Something should definitely be done about people who register having to somehow truly prove they have a qualifier before the lottery even happens! I'd like to think that those people are simply oblivious to how important this race is to many people. But I agree, if people don't have a qualifier, it's clearly not right for them to take the spot of someone who does have a qualifier. Mark seemed to do a good job weeding most of these folks out, but there were about 200 "pending" confirmation of a qualifier who were left in the pull, but I assume they factored that in to the number selected from the total, much like they know a certain percentage won't be toeing the line in June because of injury or act of God. But what do I know, really?